Stamped concrete Sealer, Penetrating Concrete Sealer, Tinted Concrete Sealer, pool decks, etc. have become very popular in the last decade. Stamped surfaces use patterns and different colors to form a beautiful look to your interior and exterior surfaces. They usually resemble slate, stone, wood, tile, flagstone, and various patterns and textures. So, why use this Stamped Concrete Sealers? Read this best stamped concrete sealer reviews to know more about it. People prefer this method because it is a much more economical way of achieving your desired finish when compared to stone, slate or brick. But just like with any other surface, stamped concrete needs to be maintained on a consistent basis for it to last longer. That’s where the stamped concrete sealer comes in. After applying different types of stamped concrete sealers on my driveway and pool deck over the years, I have decided to share with you some of the best sealers that will create a lasting impression on your stamped concrete. This stamped concrete sealer is created to protect and beautify any concrete surface it is applied on. The EnduraSeal 100% acrylic sealer is a professional grade sealer in a solvent base. It is recommended that you should apply two thin coats for it to offer perfect results. 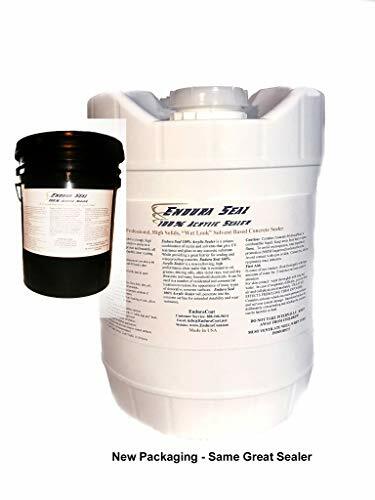 One gallon of the 5-gallon container can cover up to 300 sq. ft. depending on the porosity of the surface. After it is applied, it will leave your stones, pavers, stamped concrete, or terrazzo with a “wet look”. Thanks to its semi-gloss coating. Unlike other sealers, the EnduraSeal has a non-yellowing formula, which means that it will maintain the color of your surface for long. In addition, it is very durable but cheaper than Epoxy and Urethane sealers. Before applying the sealer, ensure that you follow the right preparations for best results. Use a roller or sprayer to easily apply it. It protects the concrete surface from harsh elements like oil, salt, water, spills, stains, etc. Some users have complained that the product leaves a white discoloration after applying. Why use toxic sealers if there are high-quality eco-friendly sealers on the market? 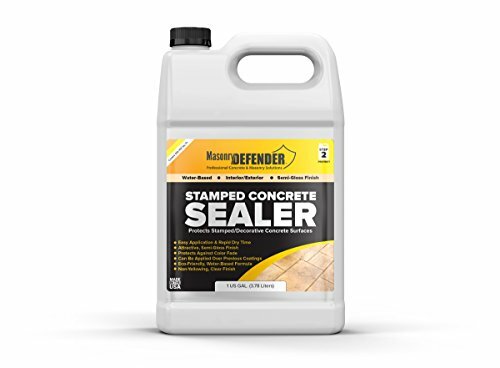 The Masonry defender stamped concrete sealer is a quality product that will leave your driveway, patio, or walkway looking as before but well protected. The water-based sealer can be applied both inside and outside structures. Also, it can be applied to previous coatings without any adhering problem. The semi-gloss finish is very attractive and long-lasting. This sealer is very easy to apply and it will dry within no time. The Masonry stamped concrete sealer is ideal for various types of surfaces as long as you begin by cleaning the concrete using the Masonry defender all-purpose masonry and concrete cleaner. It is also eco-friendly and will secure your beautiful concrete from moisture, spills, stains, fading, and UV light. There are so many stamped concrete sealers to choose from. But not all of them will give you the results that you desire. The two sealers that we’ve discussed in this post are easy to apply, durable, and perform outstandingly. They will protect your patio, driveway, pool deck, and any other stamped concrete surface from chemicals, thaw, oil, water, stains, and UV-rays. Just pick the one that meets your needs and apply it as recommended. Q. How often should I seal my stamped concrete? Ans. Most people say that their concrete looks awful after one year of sealing it. So, how often you seal your concrete depends on how you maintain it and the status that it is in. Some quality sealers will last for at least 2 years and others may last up to 5 years. Q. Should I use a roller or sprayer to apply the stamped concrete sealer? Ans. Stamped concrete is a bit challenging to coat and that’s why a sprayer is not the best option for sealing it. Instead, use a roller to level the surface after applying the stamped concrete patios sealer of your choice. Q. How long should I wait to use the coated concrete? Ans. After applying the first and second coat, it is recommended that you wait for at least 4 hours for foot use and 24 hours for vehicle use. But this also varies with the type of sealer being used. Some manufacturers even recommend using the concrete after 48 hours. So, check the instructions and follow them. Still, have a question after reading this Stamped Concrete Sealer reviews article? Comment below.